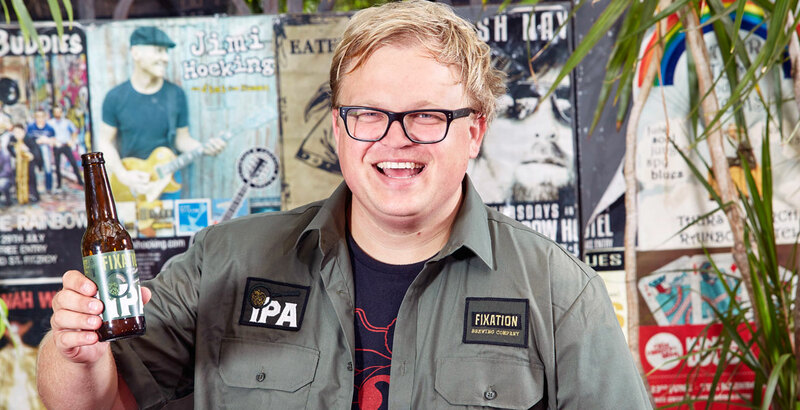 It's been one of the worst kept secrets in Melbourne beer circles and now it's official: Fixation Brewing is set to open its own brewery in Collingwood next April. The venue, which is currently going under the working title of Fixation Brewery and Tasting Room, will give the brand a home for its beers while also allowing the IPA focused brewery to release more limited batches. Fixation will also be the fourth brewery to call Collingwood home, joining The Mill Brewery, The Craft & Co and Stomping Ground in setting Collingwood on a path to become inner Melbourne’s brewing quarter. Mr Fixation, Tom Delmont, who runs the brewing company in partnership with the Stone & Wood Group, says the idea for a permanent home goes right back to the early days of Fixation and describes his excitement at finally having a site for the “hoppiest place on earth”. Once open, the 600 litre batches from the pilot brewery will mostly be sold over the bar, with the bulk of Fixation’s beers still coming out of Stone & Wood’s Murwillumbah and Byron Bay breweries. The man responsible for brewing all those new IPAs is Stone & Wood alumni Sam Bethune, who was looking to return to Victoria to be closer to his and his partner’s family. Tom says the reason Fixation’s Melbourne home has been such an open secret was entirely intentional. Both Tom and the Square Keg team (who distribute Fixation alongside the likes of Pikes Beer Company and New Belgium) didn’t want to damage their relationships with any of the bars by making it feel the decision came out of nowhere. While the Fixation bar will serve food, the plan for the venue is to showcase what his business is all about and also give those customers who often ask if they can visit Fixation the ability to do just that. “I know people cry sometimes when they visit their favourite brewery that they haven’t been to before,” says Tom, who will no doubt be hoping there are Fixation fans out there who'll do the same. With the number of Australian brewing companies at its greatest level ever and expanding at a rate of knots, Tom also says it's increasingly necessary for breweries to have a customer facing option for their drinkers. While no packaging is planned for the brewpub, punters will be able to take home growler fills – under strict orders to drink them quickly. Those who know Tom will be aware that his love of IPAs is, perhaps, only outweighed by a love for live music and Melbourne’s finest dive bars, yet he insists Fixation Brewery and Tasting Room won’t be all about the music. “Unfortunately, there will be no live music," he says. "That end of the city is changing a bit and I don’t think the residents would be that keen on having The Bennies playing inside.